Pursued by their own histories and the Chorus—an entity that scolds, blocks, and shames them in equal measure—these women are “equally damned and lost” as they cover a lot of ground looking for that mythic place where they’re not only allowed to be but where they belong. Beautiful and wily, there’s a facile poetic voice at work here. Poems tackle romantic love as easily as gallows humor, pop culture as easily as literary canon. 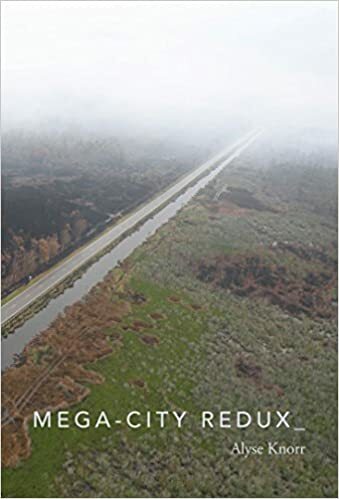 Whether it’s on the level of diction or ideation, Mega-City Redux enfolds high and low culture into something that’s intimate, immediate, and conversational. Charlotte Perkins Gilman melds with Virgil as the group journeys to an underground speakeasy in search of an oracle located within the speakeasy’s yellow wallpaper. The “wallpaper starts to shift. / Stems of flowers go asymptotic, leaves split / in half, and wall becomes hinged, unhinged, / doored—an open black tunnel inside.” Yet Dana Scully ends the scene: “Flashlight out and deep into the Unknown, / [she] plunges in ahead, believing and believ- / ing despite us.” The integration and contrast of iconic literature, and its modern, small-screen counterparts, makes both the players and the action of their play seem timeless, as if each poem’s tensions existed and will exist long after the poem’s particulars fade. Unabashedly about women, Knorr’s Mega-City Redux elegizes, probes, demands, and celebrates equally. The narrator’s search for the fabled City is as relevant now as in the 15th century. Knorr’s vision brings recognizable, shocking, everyday intimacy to the long struggle of women to exist within themselves and the larger society. Again and again, these poems ask history for something better. Yet, in the end, they also know, “The world is as safe as it ever will be.” Elegy and celebration, indeed. Letitia Montgomery-Rodgers earned a B.A. in English from Penn State and an M.F.A. in Creative Writing and M.A. in Applied Linguistics from Old Dominion University. Her poetry is published or forthcoming in Gemini, The Missing Slate, The New Poet, Gulf Stream, IthacaLit, and Menacing Hedge, among others. Her work has been shortlisted for the Bridport Prize in Flash Fiction and was a semifinalist in the 2015 Crab Orchard Series in Poetry First Book Award and the 2016 Philip Levine Prize for Poetry. A native of Pennsylvania, she currently resides in Buckingham, Virginia.